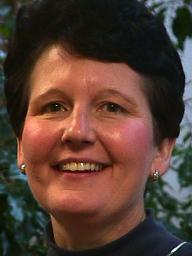 Campus Minister since August, 1989. My primary area of service is as the Marriage Preparation Coordinator/Facilitator. Much of my professional life has been devoted to two of my passions: education and ministry. I received my BA in theology and education from Edgewood College in Madison, Wisconsin. Twenty years later I received my Masters Degree in Pastoral Ministry from Creighton University. My 'informal education' in between my 'degree getting' years was enriched by working with people of all ages as educator, minister, religious education coordinator, diocesan consultant, parish and diocesan volunteer, wife, school mom volunteer, 'soccer/volleyball/baseball/etc.' mom, carpool mom, etc. Currently some of my 'extra' time is devoted to creating prayer and liturgy experiences with/and for women, domestic violence awareness programs and outreach projects. Also, I'm spending more time with my aging parents, assisting where they need extra help. Family is an another key focus in my life with my husband, Richard, and our four wonder-filled children, Sarah (husband, Paul and son, Henry), Eileen (and fiancé, Christian), Edward and Maggie (husband, Mike) - each continuing to explore the spirit within as they discover and become 'wholly' persons in their own ways. My life continues to be enriched by my family, traveling to visit our children (and grandchild :-), as well as time spent with friends, music, reading, and occasional 'fixing up' project at home. The online Daily Reflection ministry is an invitation for me to really look at and reflect on the scripture readings, both personally and in /with the cyberspace community. I usually like to look at 'my' readings a few weeks prior to writing in order to let them 'sink in' and to let the Spirit nudge me into awareness. At times, I do struggle with what the readings might hold for me. It is then that I am tempted to wander into an abstract theological or philosophical tangent. But then my inner voice reminds me to, "KISS" (keep it simple, sister), and to write about what I know & experience in the concreteness of my day to day life. Everyday life is where God's spirit touches me - and so it is there that I go for my insights, reflections and the Spirit's nudgings.